The other day I took a group of cooks on a tour of the Monterey Abalone farm and commercial wharf. We went below the wharf where Trevor explained the whole process and philosophy behind the farm. He even let us pull a fresh urchin straight out of the water and let our group try it! As luck would have it, one of Jerry's boats was just pulling in when we arrived. After our tour we wandered over to see what they had brought in. The entire hold was filled with fresh black cod and several tanks on deck were filled with live spiny heads. There was also a small amount of squid and a few skate. I know that skate is a popular fish on the east coast, but I have never seen fresh skate available in California. I couldn't pass up the opportunity to work with a new fish, and purchased two of the largest skate, so fresh they were still twitching. Once we got the fish back to the kitchen I was able to look at it more closely. 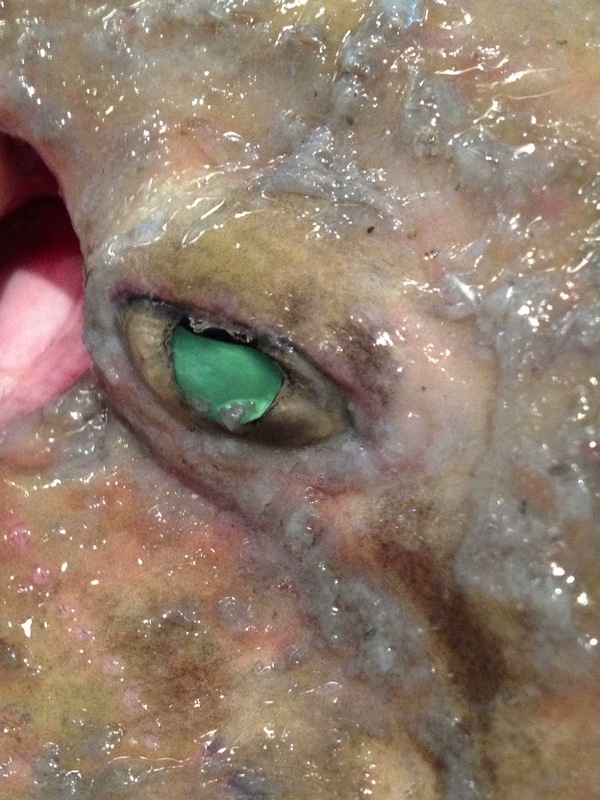 It really is an alien creature, with beady turquoise eyes and long devil tail. Simultaneously beautiful and frightening it was a strong reminder of how little we know about the ocean, and how we should conserve and protect all of its magnificent inhabitants. 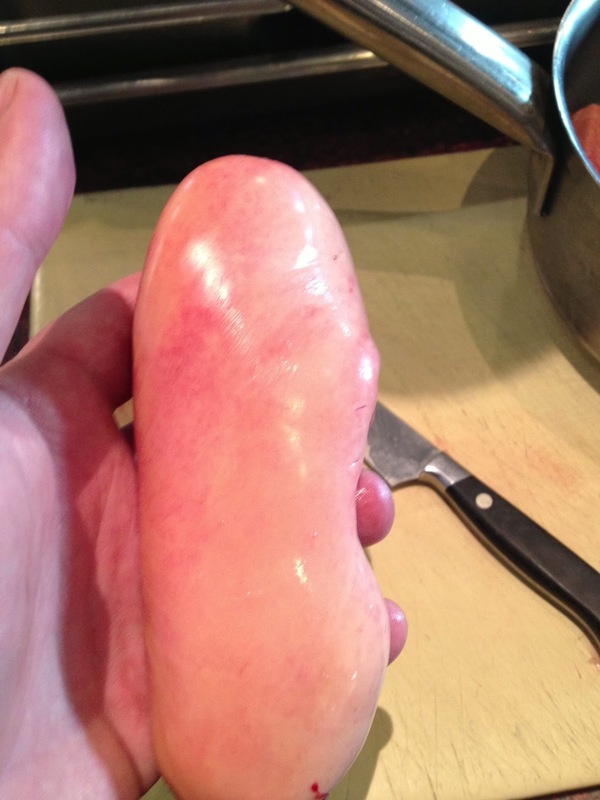 We removed the guts and were surprised to find huge-pale livers similar to those from monkfish. These livers were once quite a delicacy in France and England and were well documented in Larousse Gastronomique. Classic recipes include "Beignets de Raie" and "Skate Liver on Toast". I have used monkfish liver in the past, but have never had the chance to try skate liver. No wanted to let any part of these incredible fish go to waste, I decided to slow poach the livers with local bay leaf, garlic, lemon and milk then quickly fry them in a champagne batter. The milk poaching helps removed some of the blood and gives the liver a milder flavor. The lite batter gives a textural contrast to the smooth liver. 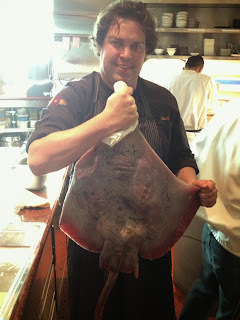 The skate wing was beautiful, like a delicate fan with bright red blood-line and firm flesh. Even though we started with two fish the yield on skate is poor, so we only ended up with enough meat to serve as a first course. 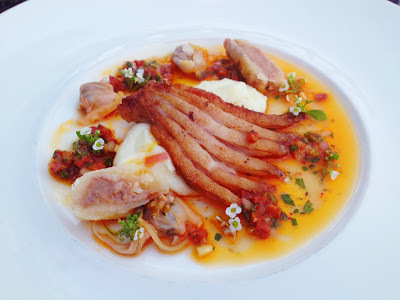 I served a small section of pan roasted skate wing with potato puree, dry chorizo, fifty year sherry and my own version of skate liver "beignets".